Just in time for summer grilling season, Brentwood sweet corn from G & S Farms returns to the Ferry Plaza Farmers Market this week. Although the United States leads the world in corn production, growing about 80 million acres (roughly as much land as New Mexico), only a tiny fraction of that corn is the summer treat you know and love. Most of the corn grown in the U.S. is the commodity crop known as “field corn,” used in animal feed, ethanol, whiskey, and all manner of processed food ingredients like high-fructose corn syrup, corn starch, and corn oil. A full 80 percent of the corn grown in the U.S. is not for direct human consumption. But before industrialization took over American corn production, maize was cultivated by the pre-Columbian peoples of the Americas for thousands of years as a staple food crop. Sweet corn developed as a spontaneous mutation of early field corn varieties grown by Native Americans, and it was introduced to early European settlers in the eighteenth century. 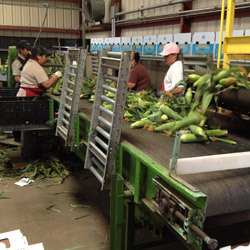 The cobs are picked during the early milk stage of kernel maturity, when sugar content and moisture levels are high, in contrast to field corn, which is harvested in the dry, starchy dent stage. Over the last century, sweet corn production in the U.S. has increased as farmers and geneticists have developed hardier and sweeter varieties. Emilio Ghigerri, an Italian immigrant, was one of the first farmers to plant sweet corn in Brentwood in the 1940s, in addition to lettuce, apricots, and other specialty crops. In 1980, his daughter, Jeannie, married farmer Glenn Stonebarger, who became a partner in the business, and the farm became known as G & S Farms. In addition to Glenn and Jeannie, Emilio’s son Roy and Roy’s son, Joe, now run the farm, along with Joe’s younger cousins, Paul and Michael Stonebarger (pictured above). During production season, the 600-acre farm employs about 100 workers and moves close to 15 million ears of corn annually, mostly through retail chains such as Safeway, Walmart, and Whole Foods as well as 30 farmers markets. With farming in his blood, Joe Ghigherri couldn’t help but lend a hand on the farm growing up. “We lived about 100 yards away from our packing shed,” he remembers. After graduating from St. Mary’s College with a degree in business, he returned to the farm in 2005 and now manages planning, quality control, and farmers market sales. 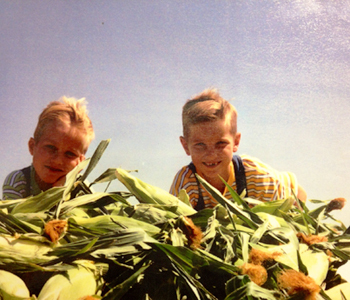 With farming in his blood, Joe couldn’t help but lend a hand on the farm growing up. “We lived about 100 yards away from our packing shed,” he remembers. After graduating from St. Mary’s College with a degree in business, he returned to the farm in 2005 and now manages planning, quality control, and farmers market sales. 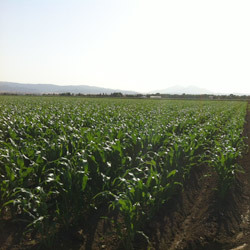 G & S grows 10 to 12 varieties of white, yellow, and bicolor corn, including the Brentwood Diamonds they’re known for. In addition, G & S tests 250 to 400 new varieties of non-GMO seed each year, working with Lockhart Seeds, a distributor based in Stockton. Since every variety has its own unique taste and growing requirements, G & S looks for cultivars that will be successful in their locale. If a variety has a strong yield the first season, it enters a three-year trial, and if continues to perform, it is put into production. Once an ear of corn is picked, its sugars immediately begin to convert to starch, so the sooner they’re eaten, the better they taste. All of G & S’s corn is harvested by hand (many commercial farms use machines for this task) early in the morning or the night before market day. The corn is sorted twice for quality control, both in the field and at the packing shed, then immediately chilled using a hydrocooler to preserve its freshness and sweetness. The corn has a shelf life of about 10 to 14 days, as long as it remains cool and the husks are intact. Each stalk of corn yields only a couple ears, and once a field has been picked, it’s done for the season. “You’re doing a lot of work for one, possibly two ears of corn per stalk,” says Joe. Corn is a heavy nitrogen feeder, so the farm enhances soil fertility by rotating crops like alfalfa, hay, and peppers into their fields every four years. As part of their rotation plan, the farm also swaps parcels of land with neighboring farms that grow different crops. See a full list of Ferry Plaza Farmers Market farmers who grow corn here. Photos courtesy of G & S Farms.